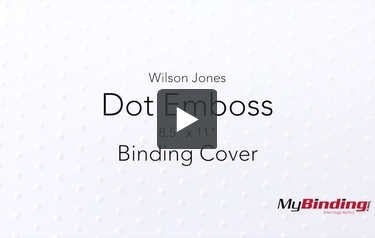 These Wilson Jones Dot Emboss covers easily add a unique and professional look to any of your documents and presentations. Using these Wilson Jones Dot Embossed presentation style binding covers, you can define a clean and professional presentation while still being progressive with a contemporary look. To get a complete custom look, try the coordinating index tabs and pocket folders. These covers are perfect for use with any CombBind , CoilBind , WireBind , VeloBind , ProClick , or ZipBind Binding Machines . This is Dot Embossed 8.5 x 11 inch Binding Covers! First, this paper is the standard size of printer paper, 8.5 x 11 inches. And it has a thickness of card stock paper, more so on the thinner side of the spectrum. This dot emboss looks great, but can also can bring some entertainment depending on what you use it for. It’s great to use as a cover for any hand made books, or even as craft paper. Using your own punching machine, you can punch any pattern onto it using your preferred binding method. Instead of the extruding side of the dots, you can even use the other side for a different appeal. When image matters, and maybe sometimes when it doesn’t, look to MyBinding for a great selection on covers.